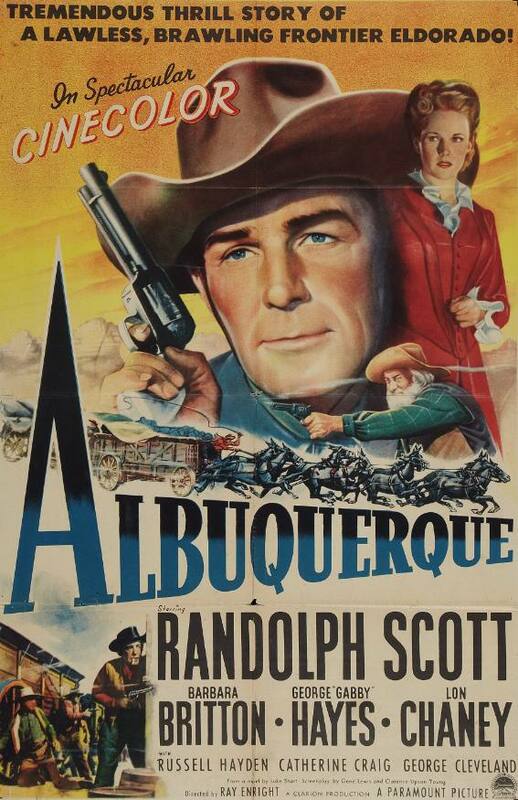 Like Randolph Scott’s last western, Gunfighters (1947), director Ray Enright’s Albuquerque was filmed in Cinecolor, which was a two-color film process that was less expensive than Technicolor. Unlike Gunfighters, it’s punchy and fast-moving, which could have something to do with the source material. Gunfighters was based on a novel by the long-winded Zane Grey, while Albuquerque is based on the 1939 novel Dead Freight for Piute, which was written by the terse, hard-boiled western author Luke Short. Albuquerque isn’t quite on the level of André de Toth’s Ramrod (1947), which was the best adaptation of a Luke Short book I’ve seen to date, but it’s a well-made B western. The lean, weather-beaten Randolph Scott plays Cole Armin, a man coming to Albuquerque to do a job. On the way there, he and his fellow stagecoach passengers are robbed by a group of masked bandits. Celia Wallace (Catherine Craig) loses $10,000 to them, and a young girl named Myrtle (Karolyn Grimes, best known for playing little Zuzu in It’s a Wonderful Life), is put in a perilous position when the stage goes out of control with spooked horses and no driver. It quickly becomes clear that more pernicious forces are at work in Albuquerque than just a few stagecoach robbers preying on wayfarers. John Armin (George Cleveland), Cole’s uncle and the man he’s come to Albuquerque to work for, turns out to have a stranglehold on the territory, and he expects Cole to help him carry out all manner of dirty business. Naturally, none of this makes John Armin very happy, and he dispatches forces both foul and fair — a hulking henchman named Steve Murkill (Lon Chaney Jr.), who appears to have been hired not only for his great strength and mercilessness, but also his ability to get hit in the face without losing the cigarette clenched between his teeth; and a beautiful young woman named Letty Tyler (Barbara Britton), who ingratiates herself to our heroes with her feminine charms and a revolver that secretly contains blanks. Albuquerque is a B western through and through (look no further than the presence of the rootin’, tootin’ Gabby Hayes as “Juke”), but its production values are solid and it’s pretty entertaining, especially for fans of Randolph Scott, who for my money is the most archetypal western star of all time. Posted in 1948, February 1948 and tagged Barbara Britton, George "Gabby" Hayes, Lon Chaney Jr., Luke Short, Paramount Pictures, Randolph Scott, Ray Enright, Westerns. Bookmark the permalink.